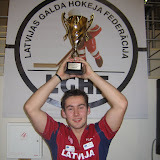 11th Riga Cup was held on December 5, 2009, at Riga's High school of Cultures. There were 137 players from 8 countries. Andrey Voskoboynikov - Edgars Caics, Playoffs 1/4, Game 6. Atis Silis - Edgars Caics, Playoffs 1/8, Game 3. Santtu Sainio - Yanis Galuzo, Playoffs 1/16, Game 1. Juho Rautio - Andrey Voskoboynikov, Final Groups. Igor Saveljev - Otto Pesala, Final Groups.